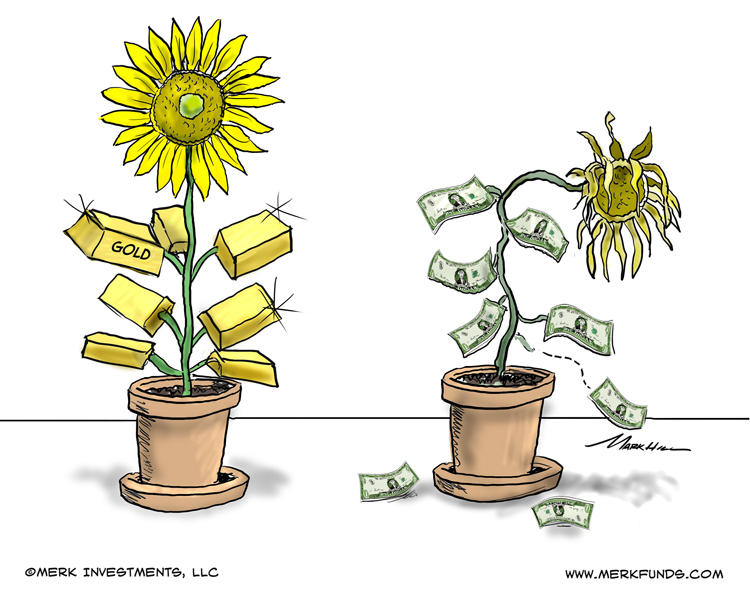 Merk Insights - Is Gold Risk Free? I’ve long argued that there may not be any safe asset anymore and that investors may want to take a diversified approach to something as mundane as cash. But what about gold? When I mentioned in a recent interview that not even gold is ‘risk free,’ it raised some eyebrows in the gold community. Let me elaborate. When we look at gold’s “safety”, let’s look at it from a storage and investment point of view. Physical storage. If one stores the gold at home, the ‘counterparty’ one needs to be concerned about is burglars. The same applies in a bank deposit box or specialized gold custodian. Insurance ought to alleviate that concern, but keep in mind that the insurance company is also a counterparty risk. Allocated versus Unallocated. Financial institutions in the business of storing gold differentiate between holding gold on an allocated or unallocated basis. Allocated means it is segregated, held on behalf of the client; in the event of a default of the custodian, the gold still belongs to the beneficial owner. In contrast, unallocated gold, also referred to as paper gold, is merely a claim against the assets of the institution. Central banks like gold because, in the words of former Federal Reserve Chairman Greenspan: “Gold has always been accepted without reference to any other guarantee” (for a summary of stunning quotes by Greenspan on gold in the current environment, please read “Greenspan: Price of Gold Will Rise"). Assuming one is comfortable with one’s choice of storage, is gold “safe” as an investment? If one asks U.S. regulators, the answer is no: only U.S. Treasuries are considered safe. If you ask gold bugs, the answer may well be that gold is the safer choice and U.S. Treasuries are the riskier choice. Which one is it? In the U.S., as in many other countries, there’s a separation of fiscal and monetary policy. This means that while the government steers income and spending, the central bank controls the amount of credit (or the cost of credit) available to the economy. The idea is that the central bank will preserve the purchasing power of the currency. If history is any guide, however, central banks have a very difficult time to preserve the purchasing power of a currency when unsustainable fiscal policies are pursued. And even during “normal” times, a central banker’s idea of preserving purchasing power is an inflation rate of around 2%. As such, since the introduction of the Federal Reserve, the U.S. dollar has lost over 95% of its purchasing power when measured by the Consumer Price Index (CPI). In contrast, the reason why many investors like gold is because it cannot be as easily “printed” (although gold production can be increased, although not as easily). But that’s also the very reason why governments are not keen on backing their currency by gold: doing so limits the ability of the government to engage in excess spending. It’s for this reason that for the past 100+ years, we have moved further and further away from the gold standard. In doing so, cash is at risk of no longer serving its function as a store of value, a key criteria of money. We argue that a government in debt does not have its priorities aligned with savers because the government has an interest in debasing the value of its debt. Debasing the value of one’s debt doesn’t solve the debt problem, but it helps to ‘kick the can down the road’, something politicians appear to be particularly good at. In the U.S., we also have many consumers with too much debt and non-voting foreigners owning much of the debt. One doesn’t have to be a gold bug to suggest that incentives are baked into the system for the further erosion of the purchasing power of the currency. Back to gold: is gold risk free as an investment? These 100 ounces are “safe” in the sense that they will remain 100 ounces: 100 ounces of gold will be 100 ounces a year from now, ten years from now, 100 years from now. But when we talk about a “safe” investment, we need to look at the purchasing power of the investment. Roughly speaking, a suit cost an ounce of gold 100 years ago, as it does today; similarly, a gallon of milk costs about as much in gold 100 years ago as it does today. However, the price of gold measured in any one currency, including the U.S. dollar, fluctuates, at times widely. This doesn’t mean that US dollar cash is preferable to gold. But what it means is that whatever one does with one’s savings is based on one’s risk assessment. Ultimately, investing is about preserving and enhancing purchasing power. The reason why we invest is because we can’t trust our government (this isn’t aimed at any one, but all governments) to preserve our purchasing power. In that process, we take risks. We invest along the risk spectrum from stocks to bonds, from real estate to commodities, to cash or alternative assets. Some reject gold because it’s an “unproductive” asset. So is your twenty-dollar bill. If one wants gold to be “productive”, one can lease it out, although that process introduces the very counterparty risk many investors try to avoid. Allocated gold may be unproductive, but that beats an asset that, by definition, is destructive. In the current environment, real interest rates, i.e. interest rates after inflation, are negative. That may make a brick (of gold) that is unproductive, suddenly comparatively attractive. Importantly, gold just is what it is. In contrast, when we reference the CPI above, it is subject to the collective wisdom of economists. Even as they try to do the right thing, many feel that annual inflation is higher than reported by the CPI. In fact, how is it possible for the price of a piece of brick to appreciate an annual rate exceeding 8% since 1970? Some may argue that this suggests gold is in a bubble, however, gold has performed similarly over the 100 year period. In our assessment, the more likely interpretation is that the CPI under-reports inflation. When it comes to choosing gold as an investment, the question is what the price of gold may do in the future. If history is any guide, the correlation to other investments, equities in particular, may stay low. It’s the positive return expectation that many have an issue with. And anyone who has followed gold for some time knows the price can be volatile. Investors can recently recall the 28% drop in 2013. 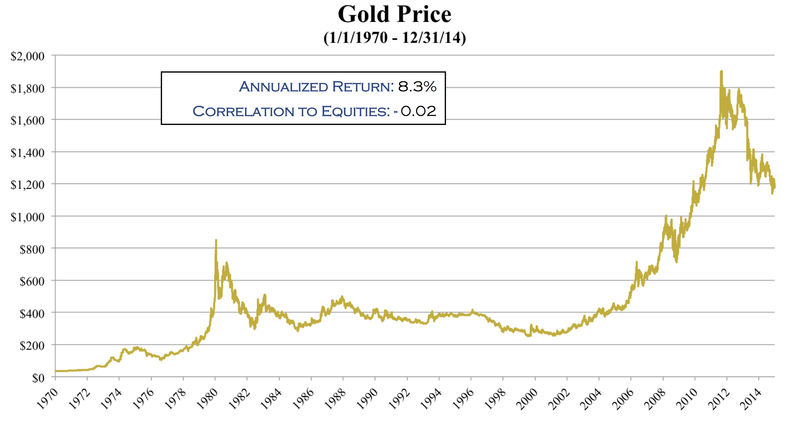 That year, the S&P soared, so gold fulfilled its role as a diversifier. In the short-term, investors are concerned about interest rate increases by the Fed: as the return on cash increases, it is competition to the brick that pays no interest. However, the FOMC statement’s last paragraph suggests to us that real interest rates may be negative to low for an extended period: “The Committee currently anticipates that, even after employment and inflation are near mandate-consistent levels, economic conditions may, for some time, warrant keeping the target federal funds rate below levels the Committee views as normal in the longer run.” Indeed, in our assessment, the U.S., Eurozone and Japan may not be able to afford positive real interest rates a decade from now. Does this make gold a “safe” investment? No. No investor should have more money allocated to an investment than they can sleep with at night. And we don’t mean physically put under one’s pillow. If one cannot stomach a severe correction in an asset, one is likely over-allocated to that asset. Talking about over-allocation: what about that equity allocation? For most investors, the equity allocation of their portfolio has done very well. In recent years, we believe volatility in the equity markets has been suppressed by central bank policy. Are you able to stomach a downturn should volatility surge? And if not, where do you hide? It’s that last part for which there’s no easy answer because central banks have created an environment where there may not be such a thing as a safe asset anymore. What investors can do is have a toolbox available to counter the toolbox of central banks. We think investors may want to consider having gold in that toolbox. How much? If you like to learn more about the role gold may play in such a portfolio, please register to join us for our February gold webinar. If you believe this analysis might be of value to your friends, please share it with them. Also, if you haven’t done so, please sign up to receive Merk Insights for free.